Sony has announced its latest DSLR camera – with the a450 bringing a 14.2 MP sensor, 7fps continuous shooting and 1,050 shot battery stamina. The camera boasts a 14.2 megapixel Exmor sensor teamed with Sony's BIONZ processor and its sensitivity extends up to ISO 12800. Also noteworthy is the Manual Focus Check Live view on the 6.7cm LCD screen. "Featured right across the DSLR line-up by Sony, SteadyShot INSIDE offers up to 4 steps of anti-shake correction with the full range of 30 α lenses and two teleconvertors, as well as compatible A-mount optics by Konica-Minolta," adds the release. "The α450 also offers the most impressive shooting stamina of any DSLR camera by Sony to date. The high-capacity battery allows up to 1,050 shots between charges - plenty for a busy weekend's sightseeing." There are slots for Memory Stick Pro-HG Duo and SD/SDHC cards and all the normal connectivity. 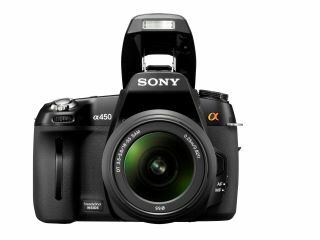 The Sony a450 has a UK release date of February with no price announced as yet.